The Confronting Informality Symposium 2016 has been successfully completed. However, we would not be able to make it without the support from our sponsors, partners, and collaborators. Thus, we would like to take this opportunity to thank every one who has been supporting us and this event. Click the logo to find out more about our partners. Most importantly, we would not be able to make it without the endless support and assistance from Department of Urbanism’s Secretariat: Linda, Karin, Margo, Daniëlle, and Astrid. This year’s symposium is organized by students from Department of Urbanism, Faculty of Architecture and the Built Environment, Delft University of Technology; including second year students from Master in Urbanism and first year students from European Master of Urbanism. Acting as the advisor for this organizing committee is Dr. Roberto Rocco, Assistant Professor in the Chair of Spatial Planning and Strategy. As one of the event’s series, we would like to invite you to join us in our Movie Night. We will be screening “Life is Sacred”, a film by Andreas Dalsgaard. The film is documenting Columbia’s most revolutionary periods against corruption and violence. It is a testimony through bottom-up initiatives and community engagement. Join us in this rare event! This movie night is a collaboration effort with POLIS Platform for Urbanism and Landscape Architecture. Pontus works with digital projects, community participation and open data at UN-Habitat, the United Nations programme for sustainable cities. He is the coordinator of Block by Block, an innovative partnership between UN-Habitat, and Mojang, the makers of Minecraft, in which Minecraft is used as community participation tool in urban planning projects. For the last 10 years he has worked with ICT4D, digital technology and communications in Europe, Africa and Latin America and holds an MA in Global Media and International Communication from the School of Oriental and African Studies, University of London. Recently he is co-author of The Citizen Field Engineer: Crowdsourced Maintenance of Connected Water Infrastructure. Scenarios for smart and sustainable water futures in Nairobi, Kenya,presented at the Third International Conference on ICT for Sustainability (ICT4S 2015) and Using Minecraft as a citizen participation tool in urban design and decision-making, presented at the Third Future of Places Conference. Find out more about Pontus’ work. Emiel is an international urban economist (PhD in Economics, University of Amsterdam, 1977) with more than 40 years of experience in a wide range of advisory and capacity building assignments across the world. Emiel has worked with a wide range of international institutions including IADB, ADB, World Bank, UNDP, UN-Habitat, and bilateral external support agencies, such as DGIS, GIZ (formerly GTZ), and SDC. He is currently the Director of UrbAct – International Advisory Services for Urban Action in Rotterdam, Netherlands, a position he also held during 2001-2007. During 2007-2012 Emiel was the GIZ Program Coordinator for the ADB , BMZ, Sida, Austria and Shanghai Municipal Government supported Asia-wide Cities Development Initiative for Asia (CDIA), based in Manila, the Philippines. Emiel has worked on long-term assignments abroad for more than 20 years, mainly in Asia. His assignments comprised work on urban infrastructure planning and programming, urban informal settlements development, urban land planning and management, urban policy programme development and management, housing policy and programme development, local government finance and housing finance, decentralisation, institutional assessments and strengthening, and project evaluation and formulation. Find out more about Emiel. Francesco is a research fellow at Gran Sasso Science Institute (L’Aquila, Italy), where he is member of the scientific committee of the international PhD Program in Urban Studies. His research focuses mainly on the nexus between spatial planning and urban conflicts. He investigated in particular the political role of urban space and the related importance of spatial measures (such as urban policies, plans and projects) aimed at shaping it with regards to the Israeli-Palestinian conflict over Jerusalem. The politics on informal housing in the Arab sectors of the Holy City is at the centre of his research. His papers have appeared in international journals such as Planning Theory, Town Planning Review, Cities, Geoforum, Journal of Urban Affairs, Land Use Policy, Journal of International Development. He wrote Shaping Jerusalem. Spatial planning, politics and the conflict (Routledge, 2016) and co-edited Cities to be tamed? The space of urbanism and planning in the urban South (Cambridge Scholars Publishing, 2014). Find out more about Francesco. Marco is an architect trained in Universitas Katolik Parahyangan in Bandung (1986) and K.U. Leuven (1990). He is co-founder of Rujak Center for Urban Studies (RCUS) in 2010 and has been its director since. He was chair of Jakarta Arts Council in 2006-2010. His notable works include reconstruction of 23 villages in post-tsunami Aceh (2005-2007) and Salihara Arts Center in Jakarta. He set up and built Bumi Pemuda Rahayu sustainability learning center in 2011. He has published four books and numerous articles in newspapers and magazines. RCUS’s current main programme is “Citizen Urbanism” in 8 cities in Indonesia. It works with communities to co-produce urban knowledge and actionable initiatives. Find out more about Marco’s ideas on community. This year’s symposium will be divided into four sessions, including three presentation sessions and a debate forum to end the day. There will also be a book launching as the result of 2014’s Confronting Informality Symposium. Brief description of each sessions is as followings. This model of governance tends to exclude inhabitants from planning processes, informality takes place. There is an urgency in changing the structures of the cities, but there is no support (either economic or social) from the local government. In this case, communities start taking lead in participatory processes, starting by bottom-up actions and reactions against certain type of urban living. In transition processes, the local governments don’t have the financial resources to confront informality, but take actions by involving NGOs and interdisciplinary groups, which are the ones working on strategies and ways to include society into the planning process, with the aim to provide them maximum coverage of basic services. At this stage, the governance model is socially inclusive, and involves community into a series of participatory processes of planning and development. The government takes a side on helping inhabitants by asking them what they need, want, and what they can do, in order to improve the current situation. The strategies start dialogue with the local inhabitants, take actions on what they need and want, and includes them as an essential part of the process of design for the expected future. Our general objective is to understand,discuss and contribute to the discourse of informality.Through this debate forum, we would like to raise awareness about the processes of informality in different parts of the world, its causes and consequences and how they are addressed through a spatial perspective. The debate will provide a platform for ideas exchange, networking, and further reflection on the theme of informality. We are publishing our speaker’s profile gradually. Do not miss it, hit the yellow button below! The 2016’s symposium entitled “Informal Urbanisation: Understanding and Mitigating a Global Phenomenon” will approach the subject of urban informality from two main cores: post-calamity environments and modernization and migration processes, with social dis-articulation and segregation as main perspectives. What is the Confronting Informality Symposium? 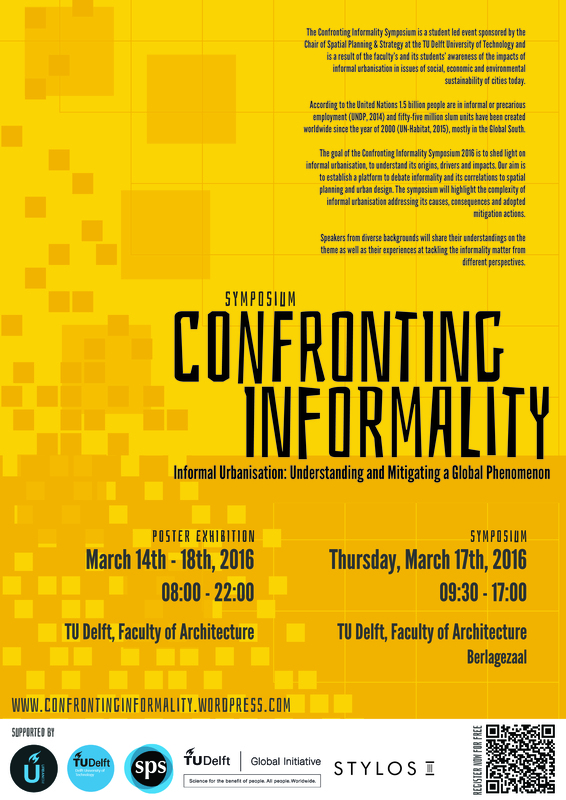 The Confronting Informality Symposium is a student led event sponsored by the Chair of Spatial Planning & Strategy at the TU Delft University of Technology. The symposium, in its third edition in 2016, is a result of the faculty’s and its students’ awareness of the impacts of informal urbanization in issues of social, economic and environmental sustainability of cities today. We recognize the importance of understanding its drivers and its relationships with other issues such as poverty, gender discrimination, social segregation and economic inequality. According to the United Nations 1.5 billion people are in informal or precarious employment (UNDP, 2014) and fifty-five million slum units have been created worldwide since the year of 2000 (UN-Habitat, 2015). The goal of the Confronting Informality Symposium 2016 is to shed light on informal urbanization, to understand its origins, drivers and impacts. Our aim is to establish a platform to debate informality and its correlations to spatial planning and urban design as well as to comprehend its impacts and liabilities on political, economic and social issues. The symposium will highlight the complexity of informal urbanization, addressing its causes, consequences and adopted mitigation actions. Speakers from diverse backgrounds will share their understandings on the theme as well as their experiences in tackling the informality matter with diverse perspectives. Along with the symposium, there will also be a poster and photo exhibition on the same theme to be held from Thursday, March 17th, 2016 until Friday, March 25th, 2016. The posters will be exhibited at the Berlagezaal during the symposium and in the Orange Hall of the Faculty of Architecture afterwards. 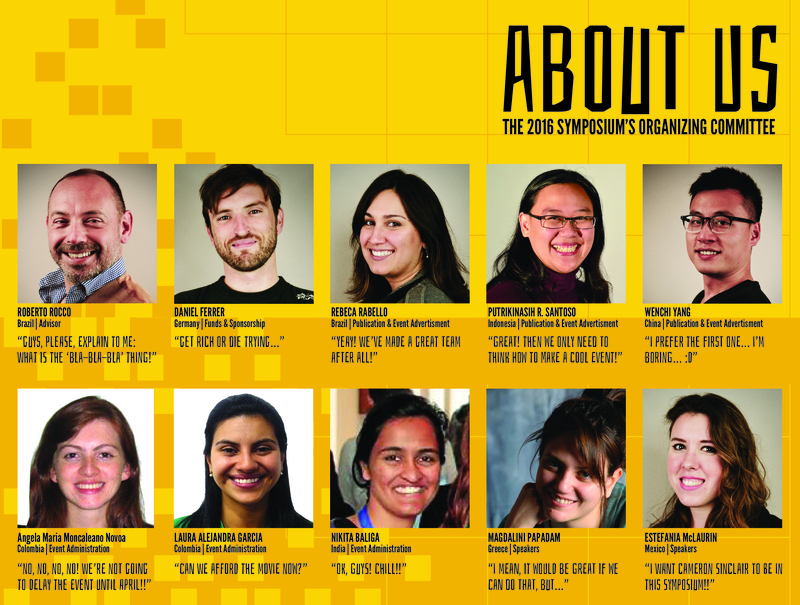 Planning to join our symposium as a participant? Register yourself here! Are you interested in submitting a poster? Please follow this link. We are so excited for the 2016’s Confronting [In]Formality Symposium! Please follow this blog, our LinkedIn page, and like our Facebook page. More information will be coming shortly.